Hey, everyone, did you know that not one, but two new Final Fantasy games were released in the last few weeks for iOS? Of course you do, because you are an avid TouchArcade reader. These are, of course, free-to-play spin-offs, but nostalgia cares not for your logic, so I think perhaps some of you want to know a little bit more about Final Fantasy: World Wide Words and Final Fantasy: Record Keeper, even if their chances of an English release appear to be dim and marginal respectively. By a stroke of luck, someone flipped the dipswitch in my system settings to Japanese, so I thought I’d bring you some brief impressions of both games. Perhaps it will help you decide how much you care if they never release outside Japan, or drop into the local App Store without a bit of English like Pictlogica Final Fantasy (Free) did. In the great battle of East versus West, one thing I think most gamers can agree on is that Japan wins the typing game category. I mean, Typing of the Dead against Reader Rabbit isn’t much of a contest. In the grand spirit of that time SEGA just about fell completely off the rocker, Final Fantasy: World Wide Words is a game where you type words quickly to kill enemies. I know some of you must be thinking that this type of game can’t possibly work with a mobile keyboard, but you’ve probably never seen a Japanese person type on their mobile devices. As it turns out, Japanese is a language that works rather well with a numeric keypad, and converting that to a touch screen only made it faster since you can swipe to access different letters. For many Japanese, tapping out words on a mobile is faster than using a full-sized keyboard. With that in mind, World Wide Words is perhaps not so much strange as it is inevitable. Right now, most Japanese publishers are chasing the success of games like Puzzle & Dragons (Free) and Monster Strike, and no one quite knows which combination of the familiar meta-game and some other gameplay type will strike gold. From Square Enix alone, we’ve seen attempts at card games, action RPGs, and picross. Here, then, is the latest attempt, fusing the familiar and beloved Final Fantasy IP with fast-paced typing action and collect ’em, level ’em, fuse ’em all mechanics. It works out okay, but you have to have very nimble fingers and it’s obviously not something that’s import-friendly. To start, you choose your first character from a selection of Final Fantasy heroes and play through a brief tutorial that explains how the various mechanics work. Missions are selected from a map and consist of a number of battles, eventually culminating in a boss fight. The battles are turn-based, but the longer you take to input a word, the less damage your attack will do. To attack an enemy, you simply type in the word next to them. For the most part, these are a grab bag of common Japanese words and series-specific references. When you want to use an ability or item, you simply select it from your menu and type out the word. For example, if you want to use a Cure spell, you have to type in “ke-a-ru", and the faster you do it, the more it heals. Boss fights are a bit more fun, since you’re spelling out the boss’s dialogue, which is sometimes pretty funny and often pulled from the main games themselves. Gilgamesh is a treat, as always. The meta-game is just like other games in this genre. Collect or buy gems, use them to pull a random character, add them to your party to make it stronger, fuse max leveled characters to increase their rank, and so on. There’s also a stamina meter with a really long refill timer, and you of course need to be online for fairly frequent server calls. 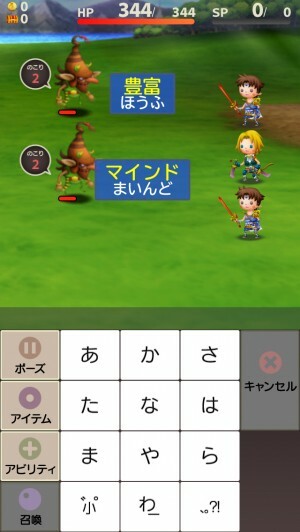 The graphics are in the style of Airborne Brigade (Free) and Theatrhythm (Free), and the music and sound effects are all pulled from the games they originally hail from. It’s an enjoyable enough game, and the typing aspect is certainly something new to me for this genre, but it seems a very unlikely candidate for international release simply by its nature. 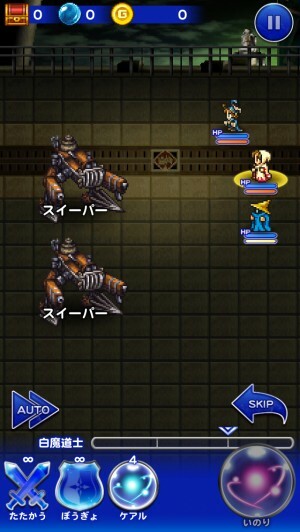 On the more familiar end of things, we’ve got Final Fantasy: Record Keeper. Let’s get the bad news out of the way right away. This is developed by Mobage under license from Square Enix, and it’s filled with many of the things the company is known and not-so-loved for. All the more surprising, then, that this is the game Final Fantasy: All The Bravest (Free) probably should have been. Don’t get me wrong, this game is packed to the gills with all the usual monetization techniques, but there’s at least some sort of game to be had here beyond feverishly pawing at your screen, and it’s fully connected to the Active Time Battle system that was synonymous with Final Fantasy during its middle years. In this game, you play as the titular Record Keeper, who has to clean up the mess made by some invading monsters. You’ll travel into pictures of the various Final Fantasy games, fighting monsters and bosses in ATB-style battles. Like World Wide Words, each mission is made up of several mini-battles, and there are timers, a mandatory online connection, and a premium currency you can use to take random equipment pulls. Completing a full set of missions often rewards you with a familiar character who you can add to your party. The worlds are based on each of the games, so for example, you’ll earn Cloud after clearing the first set of Final Fantasy 7 missions. Each character can be equipped with gear and abilities, and they all have their own special limit break-style attack. The highlight here is seeing all the beautiful pixel art, especially for games that were previously 3D. A lot of it is recycled from All The Bravest, but more of it is animated in this game, and there are a few previously unseen settings that were likely planned for that game before the audience made it clear what they thought of it. I’ve only played Record Keeper for a little while, so I haven’t hit the paywall yet, but at the very least, it’s more strategic and fun than All The Bravest. This game definitely has a higher chance of releasing outside of Japan than World Wide Words, but at the moment, it’s still fairly inaccessible for English players who don’t understand Japanese. At its core, it’s just as laden with monetization as any of Square Enix’s attempts at this type of game, but if you come into it knowing that, there’s some enjoyment to be had here for series fans. As always, we’ll bring you more information if and when we get it, so make sure to keep checking back. I’d love to see both of these games released in English somehow, but we’ll probably have to pin our hopes on Record Keeper and chalk World Wide Words up as one of those oddities that never leaves the Japanese App Store. The biggest question now is, what will Square Enix combine with Final Fantasy next?